Get the inside scoop. Sign up for our free e-newsletter and get all the latest news including daily updates during the Festival. Tickets on sale at rochesterjazz.com. Buying online is the FASTEST way to buy. Show your receipt with the barcode on your phone to enter, or print out your receipt. Order by Phone (585) 454-2060. Will Call - Opens at 7 PM. See the Will Call table in the Eastman Theatre Lobby. You do not need tickets for any free shows. All shows go on rain or shine. Food and beverages available at all outdoor stage venues, Bring lawn chairs or stools. Can be shared and transferred. No photos or names appear on shareable passes. Unlimited access to Club Pass Series shows on all nine days of the festival. See as many shows and come and go as you like. Ticket prices are the same for children, adults, students, and seniors. Pass prices are the same for children, adults, students, and seniors. Club Pass is NOT good at headliner shows at Eastman Theatre. Access Club Pass shows on any three days of the Festival at any Club Pass venue. Fully shareable and transferable. Can be shared and transferred. Unlimited access to Club Pass Series shows on any three days of your choice during the festival. Your Pass will be punched on each day you use it. After the third day, it is punched, the Pass is no longer valid. Pass prices are the same for children, adults, students, and seniors. Club Pass is NOT good at headliner shows at Eastman Theatre. Single entry access to Club Pass shows - $30 ($35 Kilbourn Hall) at the door. Cash only, no advance sales. M&T Bank ATMs are conveniently located throughout the festival site. Entry prices are the same for children, adults, students, and seniors. Doors open 30 minutes before shows at all venues. At two of our busiest venues, Kilbourn Hall and Max of Eastman Place (6 PM & 6:15 PM shows only), we offer a wristband system to save patrons time spent in line and more time to enjoy other shows and activities around the festival. Here's How It Works - Club Pass holders and those paying cash at the door may line up and receive a color-coded wristband that will specify a return time to see the show. You must be present and in line to get a wristband. Come back at your assigned time and enjoy the show! Please note: Seating is first-come, first-served, whether you have a wristband, a Club Pass or paid at the door. If you miss your assigned entrance time you can enter any time afterward up to 15 minutes before the show starts. Space will not be guaranteed if you are late. If you arrive after 5:45 (Kilbourn) or 6:00 (Max) you must go to the back of the general line. Only wristbands that are on your wrist will be accepted for entry. When you purchase tickets via the rochesterjazz.com secure ordering system you will receive a unique patron ID and E-ticket with a barcode. Customers then have several options as to how to redeem their E-tickets. Only one scan per bar code is possible. All online sales final. No exchanges, no refunds. All headliner tickets will be scanned at the point of entry to Kodak Hall at Eastman Theatre. Print your headliner E-tickets at home and bring it to the festival to be scanned. Take a photo of your E-ticket with your smartphone, and bring it to the festival to be scanned for entry to a headliner show. No paper needed! For those who prefer a ticket be mailed, tickets will be mailed for a fee of $2 per order. For those without online access, call the office at 585-454-2060, to order a Club Pass or headliner ticket. Century Payments /Authorize.net. We are a PCI Compliant Company. Delivery service is via E-Tickets, or by USPS standard First class mail. If purchasing for home delivery, please allow 4-7 business days for delivery. No refunds or exchanges. Once redeemed for an official pass, the pass is not transferable. 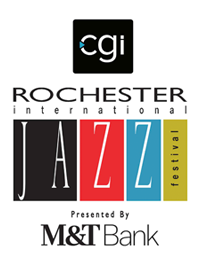 The resale of a ticket for more than its face value without the written consent of the CGI Rochester International Jazz Festival (RIJF, d/b/a RIJF, LLC) is prohibited by law. As a festival patron, you assume all risk and danger incidental to attending festival performances, inside and outside any and all venues whether occurring prior to, during, or after said show(s). You assume all risk and danger of being injured in any manner and you agree that the management, its agents, and the performers are not responsible or liable for any injuries resulting from such causes. No alcohol, drugs or weapons are allowed in any RIJF venues. Food or glass containers may be allowed in some RIJF venues, solely at the discretion of venue management. No recording devices, still or video cameras permitted in any festival venues. No transmission or aiding in transmitting any description, account, picture, or reproduction of any festival performance. You hereby consent to the reasonable search for alcoholic beverages, drugs, or weapons. You hereby consent to the use of your image or likeness incidental to any display, transmission, or reproduction of the event. Festival staff reserve the right to refuse admission or eject any person whose conduct is deemed by the festival to be disorderly or who fails to comply with the terms and conditions herein. In the event of a cancellation for which there is no rescheduled date, a refund for this ticket may be issued at the option of the festival and may not include additional ticketing fees (i.e., ticketing operations fee, shipping fees, etc. ).